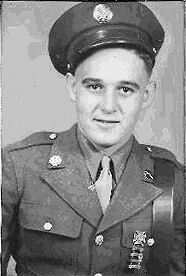 May 25, 1944 was the day of my induction into the US Army. I picked up a ride on a bus out of Providence and rode to Ayer Mass. Fort Devens. After being assigned to barracks we were given Army clothes. Then we were introduced to the G.I. Chow. Then came the first night sleeping in double bunks, seventy five men per barracks. The first week was devoted to training and marching by the platoon (30 men). Second week we started losing some friends. They were being shipped to all parts of the country. My day came the 29th of May. I landed on Camp Craft South Carolina on June 1. It was so hot that I felt like passing out. Every day it would rain at 4pm. Then the steam would come out of the woods. This infantry training camp was set up to train us in 16 weeks. We learned the articles of war, then how to take a rifle apart in a few seconds. Then we would walk to the rifle range every morning, this was a 5 mile walk in the heat. After a day training we would drink 2 or 3 beers to cool off. We had Beer Gardens all over camp.They were enclosed with fencing separated from rest of camp. I remember some nights we were called to barracks about 7pm. There we had to put on our back packs, our rifles, and get ready for a night training exercise. We would make believe we were chasing the enemy in the swamps, in the hills. We would be wet from the swamps. We would have coach whip snakes slither around your neck. Coach whip is what they called them snakes because they were about eight feet long, long like the whips you use with a horse and wagon. They would hang in the trees during the day. We would get back to barracks about 7 am. Then we would have a good meal. The next day we would have Machine gun drill. This was done in a dusty yard in the blazing sun. After a hike of 5 miles, with equipment, the sun was so hot that our shoulders were white with salt. When we would hit the barracks where the sergeant would hold the spaget for so many seconds so that you would not drink too much. The days of this summer were long and tiresome, waiting for the day that we would leave the camp. Another training exercise was, having a tank pass over your fox hole. This is a scary one. Climbing under barbed wire is another little job we had to do. The length was 250ft with machine guns firing over your head. You crawled on your belly. Finally graduation Oct 1944, 10 day furlough then report to Fort Meade Maryland, then to Camp Shanks N.Y. to port of embarkations. The ship was the Queen Mary the biggest ship on the ocean. It crossed to England in 4 1/2 days with no convoy. We got off in Gourock, Scotland and got into a L.C.I. (landing craft infantry) to the waiting trains, to bring us to Southampton, to wait for a ship to take us to France (Le Havre). It took 2 days to get into a boat on the English Channel. Then over the side in nets into L.C.I. boat to the shores of Le Havre, where we jumped into 2 feet of water, and this was November cold as hell. From the ocean we were marched to the train station and loaded into box cars marked 40 men or eight horses. Imagine how it was, we were all wet and cold. There was no heat in these cars. The route was towards Northern France. It took better than a day to land at Fort Charleroi. Our tent home for a few days. Here we could hear the heavy guns firing away in the distance. Hear you would smell the gun powder. Rain or snow every day. Here I was given my first rifle that I was going to fight with. It was coated with heavy grease called (cosmolene). The only way to get it off was gasoline which we did not have. So we had to steal some from the truckers. This camp was what was called a repot depot, a replacement outfit. From here I went to another repot depot in a factory in Malmedy, Belgium. There I spent Thanksgiving 1944. Now we were real close to the front. Nov. 29th, I was trucked to a wooded area, close to the outfit I was to join. This was the Huertgen Forest. All you could see broken trees, the smell of powder and pine wood. We stayed here till Dec. 3. On Dec 2nd, I got wounded in the leg with shrapnel. 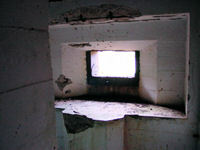 I was treated in a pill box and released to fight again. 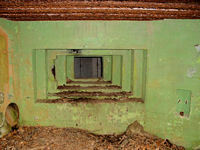 A pill box is big steal bunker; half in the ground with holes in there to put a gun through. They are like cabins made of cement 3 feet thick. 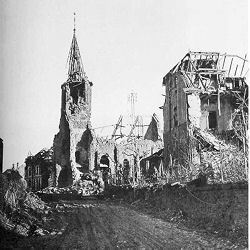 The next night, I was brought through the woods across mine fields to a bombed out town (Hürtgen) in a cellar under the light of a flambeau. I was introduced to a squad of men dirty bearded. A flambeau is a bottle of gasoline with a piece of cloth in it used to see. The sergeant was Horvat and he held a deck of cards. The four of us new guys had to cut the cards. Low man got 1st scout, 2nd got 2nd scout. As it came to pass I was 2nd scout as of this night. The next day I was first scout, this was Dec. 4th. The first scout got a million dollar wound. A million dollar wound was a wound that sent you home. On the first attack (jump off) I lost my rift 4 times. I was so scared. The artillery shells are the scary things. They call these artillery shells screaming meemies. The smell of powder and burning pine wood gets in your nostrils. 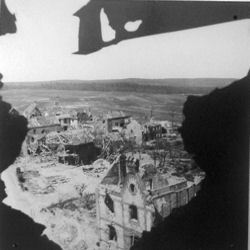 This is the town of Hürtgen; it consisted of one street of bombed houses. 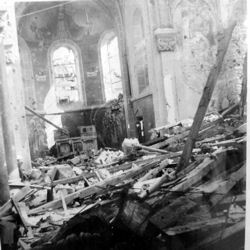 The church was the only building with two sides standing. The belfry was home to a sniper for a while. The cellars were offices for the 121st Infantry Regiment. Every afternoon at 4 pm we were bombed by a German jet plane shooting rockets. The Germans had jets, the United States did not even know about jet planes back then. 121th Infantry men passing through the town of Hürtgen. We stayed in fox holes on the outskirts of this Huertgen Forest. The Huertgen Forest was known as hell with icicles. 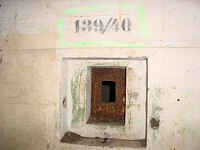 The holes were located facing Schmidt, Brandenberg, Obermaubach. All holes were wired for communication. Every outfit that attacked had a roll of communication wire they would unroll. There was a lot of wire hanging all over the place. On these phones you would hear grapefruit 1 grapefruit 2. That was the 121st regiment code. I being nineteen did not know what that meant. I thought we were getting grapefruit. Gofer was another code for another outfit. At night flares of both sides illuminated the countryside like fireworks, trying to catch somebody on patrol. You did not dare move when the skies lit up because you would be shot at. You just stood still and didn’t move. At night we would sometimes get bread and coffee shipped to us by weasel. A Weasel is a track vehicle something like a bulldozer which carries about 10 guys. 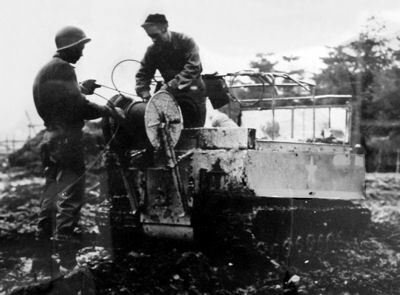 To get from place to place you had to locate wires that were guides away from mine fields. In the holes we where 2 men to guard the line. Usually it was 2 hours on guard and 2 hours sleep. One night I fell asleep right when I woke up a leg was going over my hole. It was also snowing heavy. The Germans were dressed in white they were hard to pick out. They did not see our hole so we made no noise. My partner all winter in the holes was an American German decent from Meatsville, Pennsylvania. His name was Louis Schweitzer. He was 35 years old. 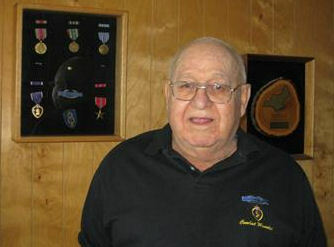 He was wounded in France suffering a bullet in his back. They were unable to take it out and sent him back out to fight. They called him pop Schweitzer. I think that he is why I speak German today. The winter was going on with more snow. It was the worse winter in 40 years in the Ardennes and in the Huertgen. We would be pulled out every 2 weeks to go by truck out of the forest to the town of Eupen, Belgium for showers. Eupen Belgium was home to a lot of coal mines so they had allot of outdoor showers. We sometimes did not get showers all we did was hunt for a kitchen that had leftovers. Sometimes we would get in trouble with these rear kitchens. They would tell us to go to our own rear kitchen, which was not in town. Rear kitchens were outside kitchens behind the lines. Sometimes some Belgium and German nuns would get the leftovers. We would tell them “Why did you give them our food”. The army would provide a band for entertainment. The sad time would be when we would leave to go back to the holes in the forest. You never took your shoes off. You watched for trench feet that’s when your feet freeze. Sometimes your toes or your feet would come back black. Then they would have to cut your toes or your foot off. When your leather boots got wet at night you would sit on them while you wore them. One time we were called to get 2 Gi’s that were wounded in a mine field. It took us better than 3 hours to get them out. They were very bad they had lost a lot of blood. To get to those men we had to clear the whole field with bayonets poking the ground. It reminded everybody to keep to the roads that were traveled. Another time I was with my Captain his name was McPherson. He was above my hole and I was lower in the hole. I can remember telling him to get down. He was standing observing with spy glasses directing artillery fire. He was killed by a sniper and landed in the hole on top of me. At one time we had captured 75 Germans in a courtyard on a big farm. We did not know how we would get out of there. About 4pm we could hear tanks coming. Did not know if it was our tanks or theirs. The Germans started sing their national anthem. As the tanks got closer they turned out to be ours. 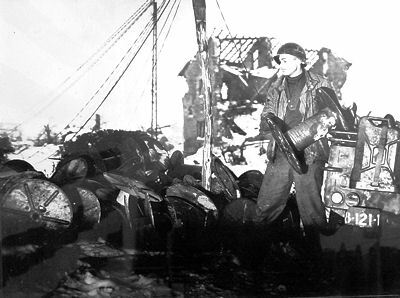 Feb 10, 1945 we left Huertgen to attack the city of Duren, after using boats to jump the Roer River. We went to Modrath/Kerpen and Frechen these were small towns dotted with farms. The fighting was very heavy and we suffered many casualties. We were on the road to Cologne. The city was blasted to nothing. The only thing standing was the Cathedral which we guarded for about a week. I took the flag off the city hall of Hermulheim a city on the edge of Cologne. From Köln we moved to Bonn where we waited a few days to cross the Rhine River. I was sent to guard a big Palace. It was Beethoven’s home. I made friends with my first German kid. He hounded me for (cowgiemy) gum. My first introduction to a German. Leaving Bonn on a pontoon bridge next to the Remagen Bridge on the Rhine River. 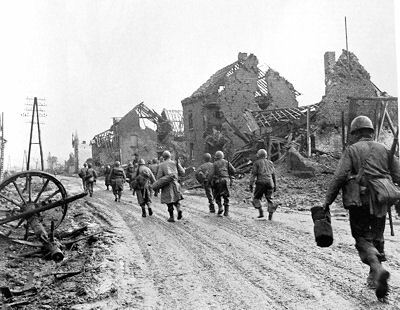 We got into battle on the outskirts of Siegen. We went to Remscheid, Solingen etc. This was the battle for the Ruhr Valley. We jumped off in the forest. I got a wound in the face while I was in a large glass factory. I spent three days in an evacuation hospital that would move ever day. I think it was in the town of Hagen. From there we took to the woods. My outfit took 3 prisoners and questioned them as best they could but all of them spoke French. I was called upon to question them about their troops since I was very fluent in French. While I was talking to them we had a barrage. This is a bunch of shells that fall all at one time. The German prisoners jumped in the first hole available and I jumped on top of them. After the attacks I was told to take them back to CP or command post which was in an old barn. I was lost in this area but I followed a communication line and it landed me to the C. P. Usually when you deliver prisoners you get something to eat plus a night to sleep. This time it was a new officer and I got nothing. I got mad. I was told to go back to my outfit. I did not. I jumped on the first truck that went by. It was a Cannon outfit from my division. For three days I slept under their trucks and ate with these guys. On the second day I helped get a guy who was wounded floating in the river. We were under fire when we pulled him out. The third day I was told that I might be missing in action by my outfit so I decided to try to find my outfit in those woods. I left early that morning in the fog. I found a path with wire so I followed the wire until I saw in the distance 3 soldiers they were sitting down. As I got closer to the soldiers I noticed they were German. As I took my rifle from my shoulder they stood up with hands up saying (Nicht Krieg) no war. Alone with 3 Germans in the woods, suppose they had a pistol under their coats. I was a little scared, but I took them back by myself. I always said that 6 Germans were my contribution to the war. I did not get a meal or night sleep with these Germans because they were packed up to leave to join the 2nd British Army. From the Ruhr Valley to the British 2nd Army in Düsseldorf. Now we will ride German tanks to the Elbe River. We took over POW camps with French Soldiers. I had a good time conversing with these guys. They didn’t believe I was American. They figured I was Canadian. We were shoulder to shoulder with Scotch Guards, Irish Tankers, Canadian Paratroopers, and British Tommies. We took thousands of prisoners as we headed to meet the Russian Army. We captured a whole Regiment of S.S. This regiment of SS are the worse Germans, dressed in black. Our men rode horses to round them up. We landed in the city of Schwerin the city of the seven lakes. The last time the seven lakes were invaded was by Napoleon. We got off the highway and guarded about 1000 prisoners in a field. The Russian Army surrounded the city with tanks and we were told to move out. We headed out in box cars and traveled for 10 days to Le Havre, France, to a tent city with million of tents. We waited there till we boarded a ship that took us to Boston, in a ship called the Liberty Ship. We took a young German boy fourteen with us. We put him in a duffle bag. He was a real nice kid that would sing songs for us. He had no home. In Boston we turned him over to immigration. I received a purple heart for the shrapnel in the leg. I never got the Purple Heart for the wound to my Face. I received the bronze star, and combat badge. I wish to thank Louise M Sutherland for sharing her dad's story.